Nerve pathways to the brain. 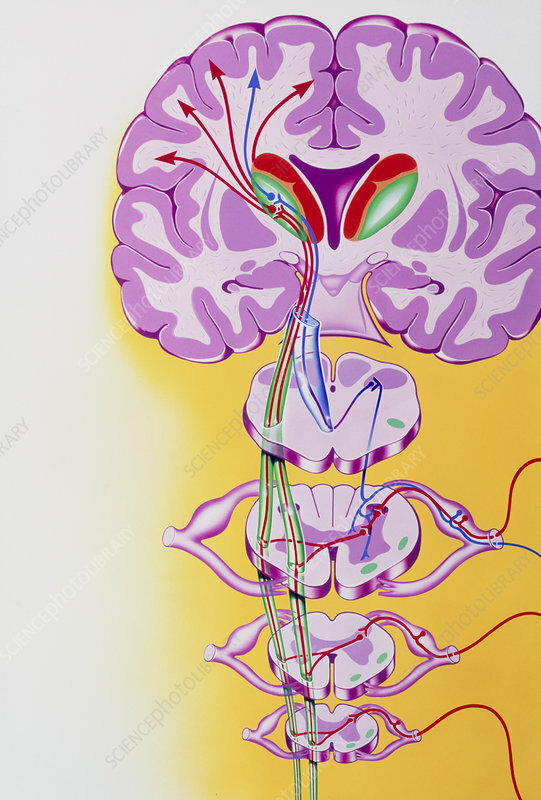 Artwork showing nerves (red & blue) leading to the spinal cord and brain. They are seen running from lower right and entering the grey matter (dark purple) of the spinal cord (shown in four sections). They then pass to the white matter (pale purple) and are carried to the thalamus of the brain (red and green). The thalamus is the part of the brain which receives nearly all the sensory stimuli from the body. It interprets the signals and relays them (arrows) to the relevant parts of the brain's cerebrum for analysis. Grey matter is made up chiefly of nerve cell bodies, while white matter is mainly nerve fibres.